Feb. 7, 2019 — When Akeem Bartley was an 11-year-old living in rural Jamaica, he made a promise to himself: He would pursue a career in medicine, a path that would allow him to provide life-sustaining care to those in need. 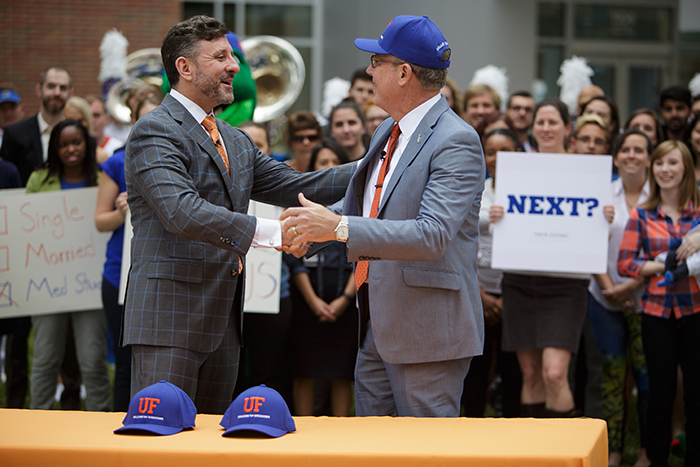 Bartley, now a second-year student at the UF College of Medicine, has taken all the necessary steps to keep his promise. He credits receiving the William W. and Marie C. Wolff Scholarship Fund as an integral part of being able to pursue his passion. The fund was established by Marie Wolff as a tribute to her husband, William, and their shared interest in medicine. Students who receive the scholarship are chosen for their commitment to principles of kindness, charitable service, sincere interest and trust among doctor and patients. As co-vice president for the UF Student National Medical Association, Bartley has made strides to realize the organization’s mission: “to cultivate physicians of color and to correct disparities among physician representation.” In his role, he’s charged with coordinating Accepted Student Weekend, an event within Second Look that introduces prospective students of backgrounds underrepresented in medicine to what the UF College of Medicine has to offer. Akeem Bartley and his fellow Health Care Summer Institute co-counselors. Bartley feels passionate about maintaining a pipeline for minority students to achieve their goals of becoming health care professionals. Last summer, he co-coordinated the Health Care Summer Institute, which affords junior and senior high school students from rural and underserved areas the opportunity to shadow doctors and receive SAT tutoring and guidance on college admissions essays. “It’s critical to have a pipeline at the grassroots level to bring underrepresented minority students here to the UF College of Medicine. That pipeline starts in high school and ends with medical training. “Between those two points, there are a lot of obstacles. We guide them along that process by making them competitive college applicants,” he says. Looking to the future, Bartley thinks he may pursue a career in vascular surgery because of the intricate technique and anatomy involved, but he’s keeping his options open. Whatever specialty he chooses, Bartley knows the impact he aims to leave on his patients.